Tiffany Lane/MEDILL Gilbert Lohoua (right) said he cannot reach his family in the western Ivory Coast and fears they may be killed. While most of the world’s attention was focused on Northern Africa – uprisings in Algeria, Egypt and now Libya – other parts of Africa have been in turmoil. Unrest in the Ivory Coast brought about a protest in Chicago this week. Protestors chanted the words of independence for the country’s former president, Laurent Gbagbo, to be released from prison and restored to power. Gbagbo refused to step down from presidency during months of violence after a November 28 run-off election against rival Alassane Outtara. Reports vary on casualties, but the latest figures say 3,000 have been killed, and about a million people displaced. 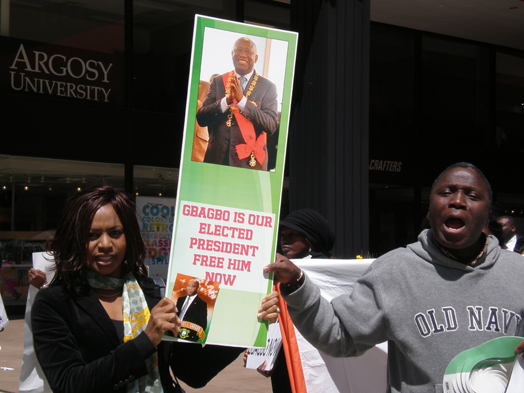 U.N. and French troops were in a 15-day conflict with Gbagbo and he was finally arrested on April 11, when he was forcibly removed from his home. “The French soldiers and U.N. soldiers will help Alassane rebels to push the election freedom away,” said Sekre Kouakou, organizer of the rally. Tiffany Lane/MEDILL Ivan Li (left), employment director of Asian Human Services in Chicago, continues to help translate Tu Huynh’s mail and paperwork after finding him a job 10 years ago. Tu Huynh has been working at a car alternator design and manufacturing company for 10 years. But before that, Huynh, an immigrant, was unemployed – something that still looms large in his mind because of his cultural background. “If you’re unemployed, you stay home all day the neighbors and friends figure out you’re unemployed because you’re always home,” Huynh said. Huynh, a Vietnamese refugee of Chinese descent, came to the United States in 1984. The National Day of Prayer can be either a day of coming together of faiths or a day of seclusion, depending on a person’s viewpoint of religion. Thursday marks the 59th anniversary of the event, and people have mixed feelings about whether the day should be sanctioned by the federal government. “I don’t think there’s any harm in calling people of faith to intercede with one another on behalf of the well-being of the world,” said the Rev. Danielle Thompson of St. Chrysostom’s Episcopal Church in Chicago’s Gold Coast. Tina Van Yzendroon, who has worked at the nearby First St. Paul’s Evangelical Lutheran Church for 10 years, said government’s role in the event doesn’t trouble her. Tiffany Lane/MEDILL Gloria Picchetti (center), member of the South East Lake View Neighbors, is among many locals angered over the possibility of a Wal-Mart coming to the area. Lakeview residents are concerned that the proposal to bring a Wal-Mart into the neighborhood will take away the cultural feel and hurt its mom-and-pop shops. “Let’s have smaller storefronts and street life like we do in the rest of our neighborhoods,” said local resident and business owner Paul Fehribach. 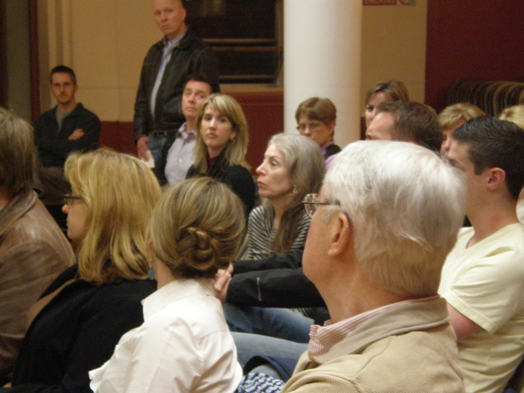 Fehribach said Lakeview residents are not looking to shop in big box developments. “It will have a detrimental effect on the feel of the street and there will be tons of traffic,” Fehribach said. Ald. Tom Tunney (44th) told residents at a neighborhood meeting Monday that he wanted to propose to the zoning committee a maximum of 25,000 feet for any retailer that took the vacancy. Mercedes dealt with numerous instances of sexual harassment by fellow workers at the Chicago bakery where she was employed four years ago. She tried telling the owner, she said, but nothing changed. “He was rude and would just brush it off or would just laugh if they would do something,” she said. Mercedes, 26, an illegal immigrant from Mexico who later became a naturalized citizen of the U.S., finally quit the job but said she never reported the abuse because she had no hope that anything would be done about it. Women immigrants in Chicago and beyond can share similar stories and worse, those who experience shame, wage cuts and even deportation in addition to abuse and harassment on the job. Maritza Reyes, sexual assault coordinator for Mujeres Latinas En Acción, a Chicago advocacy group, said that more and more women are coming to them with claims of being sexual harassed by their managers and customers at restaurants where they work. Reyes said her organization has also heard from women reporting harassment by temporary labor agencies. Tiffany Lane/MEDILL Fifteen-year Innerpac Inc. employee, Apolinar Mendoza, was one of many workers let go when the company reorganized more than a month ago. Apolinar Mendoza worked at Innerpac Inc. in Cicero for 15 years before he and more than 100 other employees were laid off more than a month ago when the business reorganized. Some who had been with the company for decades received only a few weeks’ severance pay, he said. “After so many years, we deserve better and we deserve more,” Mendoza said while picketing outside the downtown office of former Innerpac president Gene Marino on Tuesday. Speaking through a translator, Mendoza said he was making $10.88 an hour when he was laid off. He had not received a raise for three years, he said, and his previous raises had been approximately 10 cents an hour. 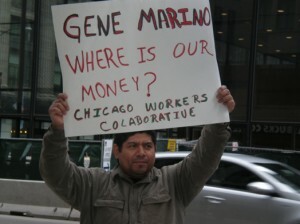 Leone Jose Bicchieri, executive director of the Chicago Workers’ Collaborative, said workers like Mendoza are vital to agricultural, food and industrial businesses in the United States. Thirteen immigrants have lodged an official complaint alleging they were mistreated while in U.S. Immigration and Customs Enforcement custody. The 13 say the abuse occurred because they are gay, lesbian, bisexual and transgender. They filed a complaint through the Chicago Heartland Alliance’s National Immigrant Justice Center to the Office for Civil Rights and Civil Liberties. One of the individuals, who was held at the Houston Processing Center in Texas from December 2009 to December 2010, is HIV positive and needs to obtain blood work for his treatment. In the complaint, he said he was shackled at his feet, waist and hands while having blood drawn. 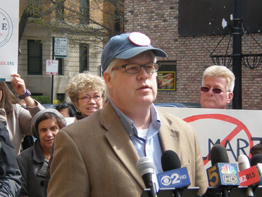 Tiffany Lane/MEDILL Bruce Alan Beal told residents and media Walmart would eliminate local businesses. One protester at Thursday’s rally against Wal-Mart’s plans for a Lakeview store found a very anti-capitalist overtone to the corporate giant’s potential effect. Harris, a former Lakeview resident who now lives in Edgewater, said Wal-Mart limits choice and agrees that it does not encourage small business. “We have a huge diversity that needs to be economically developed to be more like world-class cities,” Harris said.